By just about any measurement you care to examine, small business has a big impact in the U.S. I didn’t research the global impact of small business, but I’d imagine it has an equally large, or larger impact in other countries. Yesterday I read that Apple is sitting on over 250 billion in cash! Berkshire Hathaway held their stock holders’ meeting on Saturday (I watch it every year streamed exclusively at Yahoo). It’s very entertaining. Warren Buffett reported they’re sitting on over 90 billion in cash. Headline grabbing numbers like that focus the attention on major league players, big business. Meanwhile, every morning small business owners are opening their doors, flipping on light switches and starting another day to make their presence felt in the world. Some have no employees. Others have hundreds. Their revenues range from “not nearly enough” to “a whole bunch.” Collectively, there’s no doubt about their impact in the local economy where they reside, or the broader economies they serve. Because individually they’re not fancy, the perception is that they’re not that important. Or that their work isn’t that significant. Just yesterday Apple bought a sleep tracking company based in Finland, Beddit. Terms are undisclosed for now, but Beddit is a small business. It’s not Apple’s in house innovation. They bought it by acquiring a small business. Innovation often happens at the hands (and imagination) of a small business owner! But you don’t care about perception if you’re a small business owner. You already know the reality. Small Business Owners Make Things Happen. That’s Real. Whether it’s a local dry cleaning company that does a few hundred thousand dollars annually or a local custom home builder doing a few hundred million dollars annually…small business owners make things happen every day. Partly because they have to and mostly because they want to. In a world before chain stores and restaurants peppered every community, local businesses ruled Main Street and Maple, along with every other street in town. Gas stations were called “filling stations” and even if they bore a national brand name, the owner was a local guy. That historical DNA hasn’t changed. These were people brave enough, driven enough and crafty enough to make a business come to life. They learned how to operate, make a profit and the most successful ones learned how to grow. The competition changed. Big business spread nationally, then globally. Small business suffered and thrived, all at the same time. The weak operators fell away. The strong operators just got stronger, finding ways to adapt with speed unmatched by big business. Nimble. Fast. Adaptable. Those are the strengths of small business. And the competitive edge enjoyed by many small business owners. Size Matters, But Not Like You Think. Small business owners may want a larger individual impact. That is, the one-store operator may want to open up a second location. The local small business owner may want to become a regional operator. The regional operator may want to expand nationally. Some small business operators confidently lead companies that generate in excess of $200 million. Others may struggle to break the million dollar mark. The size doesn’t necessarily determine smallness, but I rather view the proximity of the owner to the work. Most big businesses are run by executives, professional managers. 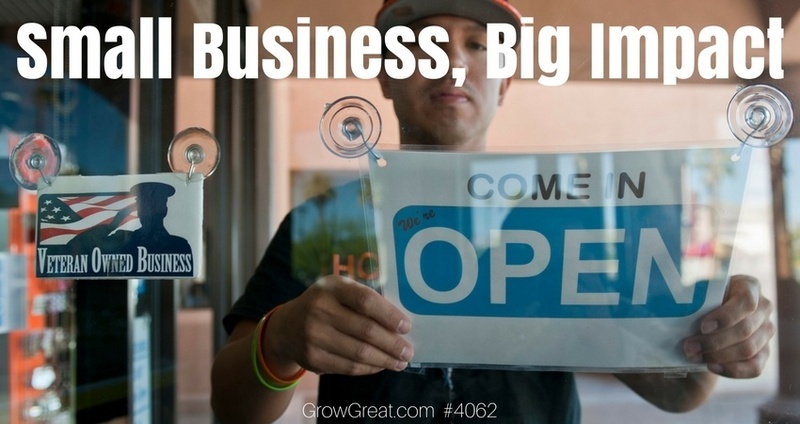 Most small businesses are run by operators, people who know how to actually get it done. It doesn’t mean small business owners don’t know how to delegate, but that’s a more common problem in their ranks. Professional managers at the helm of big business know how to operate at scale. That means they understand how to get things done through others. Small business owners can struggle as they learn those lessons. It’s not better or worse. It’s just different. For nearly a decade I’ve worked mostly one-on-one with business operators to improve all three of these areas. Now it’s time to narrow the focus, but broaden the impact. That’s why I’m launching the Bula Network Owners’ Alliance – a peer advisory group of 7 small business owners from around the U.S. Because I know firsthand the big impact small business has. And I know the impact small business owners can have on each other when they focus their attention on improving and growing their businesses. Nothing works better! Nothing substitutes the impact small business owners have on each other as together they get more focused on growing their businesses. Nothing. Here’s the rub. Sounds simple, but it’s hard. I typically encounter two types of entrepreneurs. I’ve found it pretty easy to classify business owners into just these two groups: those eager to learn and those resistant to learn. The high achievers are eager to learn. They’re open to close examination of what they do and how they do it. They’re also eager to share it and perhaps defend it. But, they’re also always looking for ways to squeeze more productivity, revenue and profit from the machine. They have high expectations. The thrill of the climb fuels them and their entire team. No matter how high the climb was today, tomorrow’s summit will be higher. These are the business owners I’m always attracted to serve. The process isn’t complicated, but it’s demands high courage. Questioning your answers requires an intense focused drive to get better. These small business owners do not want to lose. They’re among the most competitive people on the planet. They hate to lose. Contrast that with those resistant to learn and they’re okay with whatever results come their way. They sound optimistic, but mostly they shrug with modest approval on what results come their way. Not the high achievers. They’re hacked when the numbers aren’t what they could be. Even maniacal when people falter in performance. I can begin the conversation asking small business owners to tell me about their sales process and the high achievers will readily share and ask for feedback. The others are immediately in defensive mode, making sure they explain why they do what they do — and how there’s no way it can happen any differently. Nobody Can Care More Than You Do. A big part of why I’m launching the Alliance and turning Bula Network into what it was probably always destined to be — a peer advisory company for small business owners — is the realization I made a few years ago. Because my empathy is so ridiculously high I often have to tap the brakes on my level of caring. It’s a business thing. And I know it. I’ve always known it. Can a person care too much? Absolutely. Empathy enables me to understand people. So I talk to a business owner or CEO and they find no value in questions, answers or questioning answers. I’m empathetic to them. But earlier in my career I wanted to help people see value where they didn’t or couldn’t see it. Until I realized I was wrong. And learning the truth changed everything. It’s impossible for me to care more than my customers. It wasn’t a customer problem. It was MY problem. In my younger days I did care more than customers. It’s a hard lesson to learn because it requires empowering people to do what they want. And it required me to walk away respecting their point of view and decision. Here’s what happened. I started saying no to people. I started having longer conversations with people who cared and wanted to improve. I started having shorter or no conversations with those who didn’t. Suddenly, everybody was winning. Those owners and CEOs who didn’t want to learn were no longer bothered (not much). Those eager to learn happily engaged, anxious to find out what I might be able to do to help them. That’s the lesson for you as a small business owner! I have a friend who helps people with their finances. We were engaged in a bit of a coaching call the other day as I was working to help him with some processes and work flow issues. His work is very focused on helping clients realize they’re losing money in a variety of areas of their life. Some of his prospects are losing lots of money. It’s as though they have holes in their pockets. But not all of his prospects act as though they care that much. Some do. Many don’t. Over the course of an hour long phone call I probed and probed. We reviewed the language used to communicate to prospects, the calls to action made and most everything in the front end of the sales funnel. I challenged him to make a few small, but impactful tweaks. Every single adjustment pointed to this one truth: you can’t care more than your prospects or customers. People who don’t care about how much money they lose aren’t ideal prospects for anybody in the financial services game. Just look at their behavior. They don’t mind losing their own money…why would they want to take time out of their life to get your help? And why would they pay for what you can do for them? Answer: they wouldn’t. So I told him to blow them off more quickly and focus on the prospects who cared more deeply about the money they’re losing. When small business owners start operating with the understanding that their biggest impact is going to be serving people who care more, then higher success follows. In a recent video on selling I talked about getting visibility with people, then helping people understand what we do and why it’s valuable, then ultimately working to achieve an appreciation from the prospect so they’re willing to buy us. You can win the first two stages and still lose because people just don’t appreciate what you have. That speaks directly to this issue of caring more than they do. People won’t buy your stuff if they don’t appreciate as much as you do. And no amount of appreciation on your part will help them appreciate it. No amount of talking with help either. Move on! Nearly every small business owner I’ve ever served has been searching for better customers. It’s hard to accomplish because it demands seemingly unreasonable courage. The courage to walk away from the less than ideal customer. The courage to stop trying to convince people who won’t appreciate your product or service no matter how much effort you give. Stop caring as much as the people who don’t care enough to appreciate you. I want your small business to have the biggest impact possible. I don’t want to determine that. That’s your job as the small business owner. My role is to serve those of you who deeply care to climb just as high as you can. Right now, my role is to find those of you who care as much as I do about taking your small business to new heights of success. Right now I’m just looking for 14 of you to fill one peer advisory group that will meet in the morning and one that will meet in the late afternoon. You can find details here. And starting now I’m going to dive more deeply into content here and in the podcast aimed at serving you small business owners who care enough to achieve more. TEAM does mean together everybody achieves more. It’s always been true and in the coming years it’s going to prove even more true among leaders and business owners. Our success is always enhanced when we surround ourselves with people who care enough to help us and when we match or exceed it with our own commitment to ourselves. Be bold. Be courageous. Let’s find a way to achieve more together!